For every other Mythos pedal on our website, I had a blast researching the mythology behind each name and connecting it to the inspiring tone of these wondrous hand-built creations. However, for the Wildwood Edition Mjolnir Overdrive, there is no need to do any historical sleuthing, because it has already attained mythical status--and for good reason. Simply put, the Wildwood Edition Mjolnir is one of the most inspiring tone-shaping devices I've ever had the privilege of plugging into. Frankly, the fact that Zach at Mythos chose to put our name on a pedal that will no doubt achieve legendary status in the pantheon of world-class stompboxes is one of the greatest honors ever bestowed on Wildwood Guitars, and we can't thank him enough for taking us on a ride to sonic Valhalla. Let's take a closer look and see what makes the Wildwood Edition Mjolnir such an impressive, expressive pedal! To talk about why this seemingly-simple overdrive opens up a new world of gristle-laden gritty goodness, we'll need to go through a quick rundown of what it is. Here are the quick and dirty details: it's based on one of the first Mythos prototypes Zach ever built--a dirt pedal inspired by the Klon Centaur circuit--but with a few small-but-significant tweaks that change the overall voicing. The most important change is the addition of new-old stock Germanium clipping diodes from Zach's stash. This may sound like a small change, but each tiny diode has a greater effect on the voice of the pedal than any other part! Furthermore, Zach actually hand-matches the component values for each pair of diodes to ensure that each and every pedal has the perfect level of musical compression and a pleasing overall timbre. But, the question remains: does all of this obsessive attention to detail translate to tone once you click the switch and unleash the beast? Well, I can only speak for myself, but when I turned the Wildwood Mjolnir on, I felt like doing a series of cartwheels and handsprings while bellowing my way through Three Dog Night's "Joy to the World" at the top of my lungs. Or maybe I felt more like hopping in an old Camaro and doing 120 MPH down a mountain highway while blaring Steppenwolf at six thousand decibels. You get the idea: the Wildwood Mjolnir creates helps give your guitar that extra little bit of juice that makes you feel and sound like a rock god. 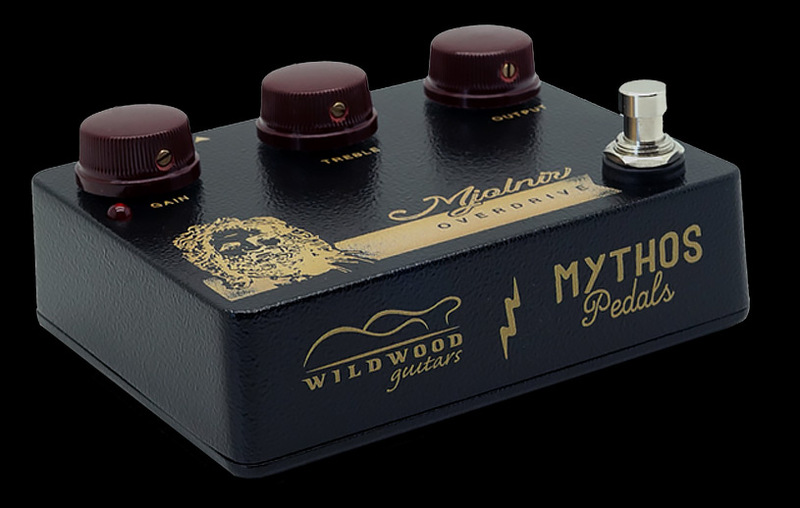 Simply put, the fine folks at Mythos have imbued these pedals with the sort of rock and roll sound that hits you on a visceral level. Playing a power chord makes your pulse quicken and your liver quiver! In more concrete terms, the Wildwood Mjolnir's sound has a translucent quality. When you engage the pedal, your rig still sounds like your rig--just better! So, it's not as "pure" and "transparent" as some other Klon-inspired pedals, but I can't see why anyone would want complete purity or transparency when they can have the glorious glassy, smooth, dirty sheen that the Wildwood Mjolnir provides. With the gain dimed, it has a cutting, aggressive quality that calls to mind the gnarlier side of the classic rock side of the radio dial, but it never comes within a hundred miles of harshness thanks to the sweet, singing top end. When you lower the gain, the Wildwood Mjolnir rewards you with the sort of light-to-moderate crunch that recording engineers spend hours chasing in the studio. And those who like to play fancy chords with a crunchy sound need not fear the twin evils of muddiness and flubbiness, because the Wildwood Mjolnir always remains clear and balanced with exceptional note separation even with lots of gain. Also, no matter where you set its controls, the Wildwood Mjolnir's amp-like touch-sensitivity remains intact, allowing you to coax lots of different timbres out of the pedal by altering your right- and left-hand technique. 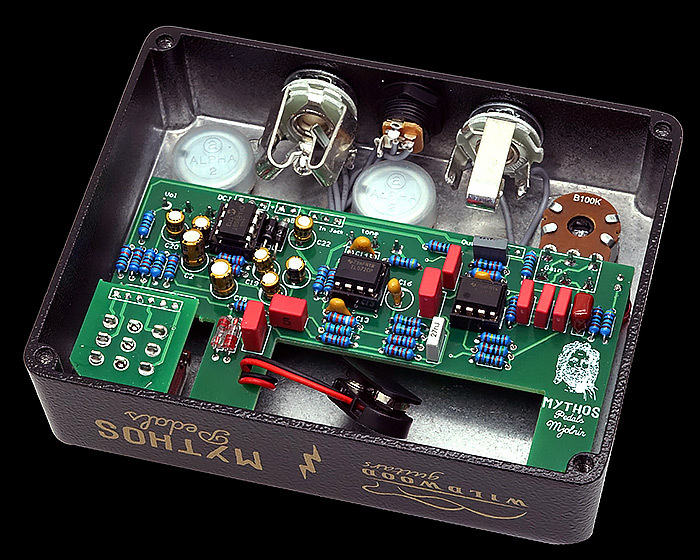 This marvelous Mythos pedal sports a "treble knob" rather than the typical tone knob, and it is a welcome substitution. Essentially, you use the treble knob to dial in how much sparkle you want in the highs. Turn it all the way up, and you'll be delighted by the beautiful cloud of golden-hued overtones that bloom in the trebles! Roll it off, and you'll get a more transparent, warm 'n' woody sound. There are many inspiring sounds hiding on the treble knob at points in between those two extremes, and it's easy to lose an entire afternoon exploring all the myriad possibilities it presents. 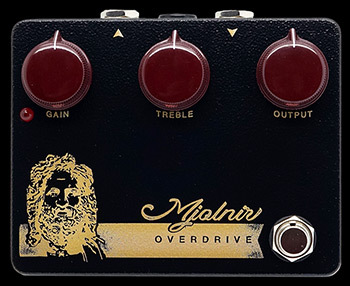 We believe that the Wildwood Edition of the Mythos Mjolnir Overdrive is as inspiring as any vintage Tube Screamer, seventies Big Muff, eighties Rat, or sixties Fuzzface. We have no doubt that you'll become a fervent believer within a few seconds hitting the switch, and we invite you to experience the magic of a brand-new legend being born by plugging into the Wildwood Edition Mjolnir.